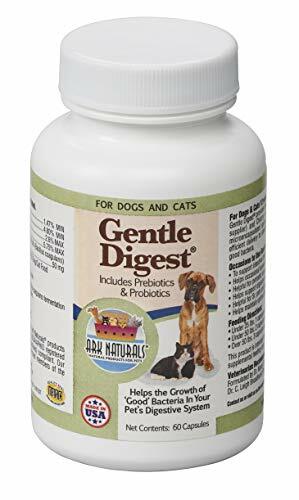 Ark Naturals Gentle Digest pets with digestive problems have trouble breaking down food into nutrients their body can absorb, leading to diarrhea, gas, and constipation. These easy-to-feed capsules replenishes the helpful intestinal bacteria all animals need for proper digestion, making it easier (and less smelly) for your pet to do their business. They're a safe and non-habit forming supplement for your pets, made to ensure your pets' gut health. They're suitable for cats and dogs over 12 weeks of age, which makes them ideal for multi-pet homes with both dogs and cats. Supplements help stimulate the growth of good bacteria needed to help break down food into nutrients in pet?s digestive system. Safe and non-habit forming for your pets to ensure that they support your pet's digestive tract without any harmful side effects. Helps reduce occasional bouts of diarrhea or constipation with the absorption of critical nutrients. Capsules contain prebiotics and probiotics to promote growth and reproduction of beneficial bacteria. Made without wheat, corn, soy, yeast, artificial colors, flavors or preservatives. Ark Naturals Happy Traveler Bite Size Soft Chews Make travelling with your furry friend more fun with Ark Naturals Happy Traveler Dog & Cat Chews. These easy-to-feed chews are made with an all-natural, herbal calming formula that helps pets get through stressful situations like vet visits, traveling in cars or planes, fireworks, and thunderstorms. After all, a car ride could mean a trip to the park, but it could also mean a trip to vet. Chasing a ball and being chased by a thermometer are two very different things! These safe, non-habit forming chews help calm your pup without making them lethargic--so go ahead. Give that pup a chill pill. Contains all-natural ingredients with no wheat, corn, soy, yeast, artificial colors, flavors or preservatives. Helps ease separation and travel anxiety, motion sickness and tension caused by changes in your pets daily routine. Great for pets recovering from surgery and are non-habit forming. Relieves stress related to car and plane trips, vet visits, or separation anxiety. Vet recommended bite sized soft chews are for dogs and cats 12 weeks or older. Ark Naturals Happy Traveler Make travelling with your furry friend more fun with Ark Naturals Happy Traveler Dog & Cat Capsules. These easy-to-use supplements are an all-natural, herbal calming formula that helps pets get through stressful situations like vet visits, traveling in cars or planes, fireworks, and thunderstorms. After all, a car ride could mean a trip to the park, but it could also mean a trip to vet. Chasing a ball and being chased by a thermometer are two very different things! These safe, non-habit forming capsules help calm your pup without making them lethargic--so go ahead. Give that pup a chill pill. All natural herbal supplement formulated to relieve anxiety in pets, ranging from separation anxiety to day-to-day stresses. Calms your pet so they?re better equipped to handle whatever triggers their anxiety, without making them drowsy or lethargic. Soothes pets during stressful or nervous times like vet visits, house guest, and bath time. Especially helpful during thunderstorms, fireworks, travel, and long car rides. Helpful in relieving motion sickness, getting rid of upset stomachs and stimulating the appetite of finicky eaters. Ark Naturals Neem Protect Spray Spray - 8 oz. Ark Naturals Joint Rescue these supplements are chewy glucosamine supplements with Ark Natural's blend of comforting herbs to keep your pet feeling their best as they age. It takes a lot of support to fetch so fast, jump so high, and pounce so quick, after all! These chews also reduce soreness to help keep your pets comfortable during normal activity and daily exercise. Plus, they're tasty, so you won't have a problem treating your pet to health joints. Chewable supplement is made to visibly reduce discomfort associated with daily exercise and morning stiffness. Contains therapeutic dosages of glucosamine plus anti-inflammatory botanicals, which improve joint mobility and provide relief for symptoms of pain and inflammation. Reduces soreness and helps keep your pets comfortable during normal activity and daily exercise. Natural product supports cartilage and joint function alleviating pain allowing mobility. Highly palatable, easy to use chewable supplement makes it easy to administer. Ark Naturals Joint Rescue Chewable Tabs Chewable Tabs - 90 ct.
Ark Naturals Sea Mobility Joint Rescue Chicken Jerky Strips Jerky Strips - 9 oz. Ark Naturals Sea Mobility Chicken Jerky keep your playful pal feeling their best with Ark Naturals Sea "Mobility" Joint Rescue Lamb Jerky Dog Treats. These treats are made from USDA inspected, farm-raised lamb and four soft chew jerky squares contain 500mg of glucosamine to improve mobility and keep joints and hips functioning properly. They're ideal for elderly pets with age-related discomfort and active dogs who run themselves silly. Joint inflammation? Not so great? A chewy strip of lamb? Now you're barkin'! These joint-support chews are made with farm-raised, grain-fed USDA lamb. Delicious, jerky chews don't look, taste, or smell like a supplement, so your dog will love them! Made without wheat, corn, soy, hormones, antibiotics or by-products for the health of your pet. Combines glucosamine, MSM, chondroitin and sea cucumber to relieve arthritis symptoms and joint pain. Beneficial for active, senior and service dogs to keep them at their healthiest for longer. Ark Naturals Neem Protect Shampoo for Skin and Coat 8 oz. Ark Naturals Neem Protect Shampoo is an environment friendly, gentle, and non-drying formula for cleaning dirt, oil and sebum from your cats and dogs. The active ingredient Neem is a tree native to the Indian subcontinent whose oils and extracts are anti-inflammatory, gentle and non-drying. Regular use helps to soothe and reduce itching and dermatitis caused by insect bites. Contains no sodium laurel sulfate. Made in the USA. Ark Naturals Neem Protect Shampoo Shampoo - 8 oz. Ark Naturals Sea Mobility Wheat-Free Venison Jerky support and protect your pets' joints with Ark Naturals Sea "Mobility" Joint Rescue, and keep your furry friend hopping! These supplements have 500mg of glucosamine and chondroitin per four delicious soft chew squares. It takes a lot of support to fetch so fast, jump so high, and pounce so quick, after all! These chews help keep hips and joints free from pain and functioning properly. Plus, they're a tasty jerky treat made with real, tasty meat so you won't have a problem treating your pet to health joints?your pup won't even know they're eating a supplement! These joint-support chews are made with farm-raised, grain-fed USDA venison. Delicious, jerky chews don't look, taste, or smell like a supplement, so your dog will love them! Made without wheat, corn, soy, hormones, antibiotics or by-products for the health of your pet. Combines glucosamine, MSM, chondroitin and sea cucumber to relieve arthritis symptoms and joint pain. Beneficial for active, senior and service dogs to keep them at their healthiest for longer. Ark Naturals Sea Mobility Joint Rescue Venison Jerky Strips Venison Strips - 9 oz. Ark Naturals Gentle Digest™ Capsules contain natural prebiotics and probiotics. Probiotics provide a source of beneficial intestinal bacteria while Prebiotics help stimulate the growth and/or activity of probiotics. Helps to support a healthy immune system and support intestinal balance. Helpful for periodic issues with gas, flatulence, smelly and irregular stools. Helps to support digestion and absorption of critical nutrients and pets under stress. Made in the USA.